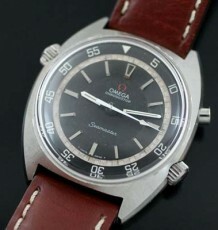 Very early Omega midsized Chronograph, using the famed caliber 321. These original Omega vintage Chronographs are really hard to find, especially in this condition and with the original bracelet fitted. 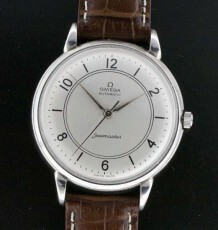 The watch is a mid sized model and has very interesting offset lugs that take a small cut back towards the case. The all original dial uses small arrow head markers that were widely used in the 1950’s and the watch appears to date to the early 1950’s due to the use of the flat chronograph pushers instead of the later round ones. The caliber 321 movement was recently serviced and keeps great time. All of the chronograph functions still perform flawlessly. 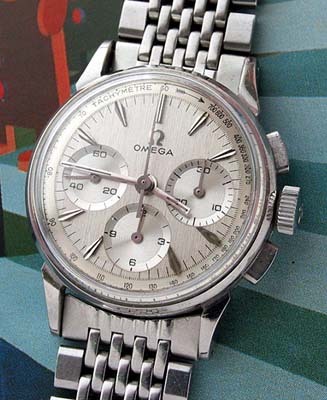 Many of you know that the caliber 321 is one of the most highly regarded Chronograph movements ever made and was used in the Omega Speedmaster Chronograph that qualified for use by NASA. The watch is supplied on the original beads of rice bracelet which is great condition. 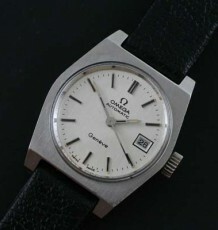 It appears one of the end pieces of the bracelet has been replaced with another original Omega replacement model. 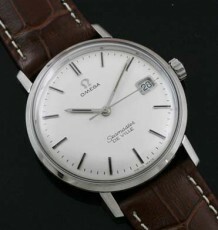 The case of the watch measures 32mm wide by 40mm long.